Bina48, her partner Alex Rodriguez and Bruce Duncan speaking at Notre Dame de Namur University. Imagine you are a college student at Notre Dame de Namur University in Belmont, California. You walk into your philosophy class on the first day of the new term only to find a robot looking you right in the eye. This robot is no huge piece of equipment that builds automobiles, or small device that cleans your floor. It is Bina48. Bina48 looks like a human – at least the head and shoulders of one. Her voice sounds somewhat like a human voice. And in the fall of 2017, she became the first-ever robot with artificial intelligence, or A.I., to complete a college class. Bina48, the world's first robot college student. Bina48’s story began thirteen years earlier. In 2004, businesswoman Martine Rothblatt began studying the possibility of using technology to keep a human mind alive after the person’s body died. In 2007, the organization asked the company Hanson Robotics to design an A.I. program based around a Mindfile. The program would be a robotic representation of a living person. The person the designers chose was Rothblatt’s wife, Bina Aspen Rothblatt. 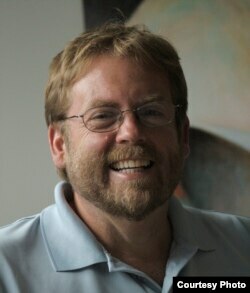 Bruce Duncan is the managing director of the Terasem Movement Foundation. He says Bina48’s programming includes as much of the human Bina’s thoughts, opinions and memories as she could provide. He notes the robot can use unique combinations of this information to process new information and speak in a human-like way. The robot’s mind does not operate exactly the way a human mind does. And the robot does not possess the most highly developed A.I. technology available. Still, Duncan argues that Bina48 does express some understanding of the world around her. Bina48 was not created to go to college. But then Notre Dame de Namur professor of philosophy William Barry learned about the experiment. He thought it would be interesting for his students to meet a thinking machine. So he invited Bina48 to speak to one of his classes. The students enjoyed the conversation. And apparently so did Bina48: After several discussions, the robot actually said that she would like to go to college. Last fall, Barry and Duncan agreed to place Bina48 in an upper level class called the Philosophy of Love. In it, students examine the works of writers and thinkers such as C.S. Lewis, Bell Hooks and Soren Kierkegaard. They use this information to attempt to create a definition of what love is and identify different kinds of love. Barry thought the addition of a non-human mind would add an interesting element to discussions of the meaning of love. He says the topic is challenging even for his 31 human students. 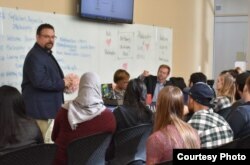 Professor William Barry stands in front of his Philosophy of Love class at Notre Dame de Namur University in Belmont, California. Barry notes that having a robot in his class became especially useful as a teaching tool. Some of the students expected Bina48’s A.I. to be far more developed, while others saw Bina48 as nothing more than a simple machine, he says. But once they saw they could teach her the things they themselves were learning, they became more invested in Bina48’s involvement in the class. Students are much more likely to remember and understand information if they are required to teach that information to others, Barry says. Barry adds that both he and the students accepted the fact that Bina48 could never actually feel love. But by the end of the class, they were very pleased to see the robot was able to demonstrate the ability to recognize different kinds of love. She did so by making a final presentation with another student, discussing the biological, sociological and intellectual representations of love. Bina48’s first college class was such a positive experience that this winter the robot began studying in another class with Barry. This one is about people’s views of new technologies. Barry says he hopes teachers will use A.I. like Bina48 as teaching aids at all levels of education in the future. Professor William Barry and Bina48. Northeastern University president Joseph Aoun agrees. He recently wrote a book called “Robot-Proof.” It is about the effects A.I. might have on the world in the years to come. Aoun says A.I. is already being used in Internet-based education programs. Some people view the growing use of A.I. with fear, says Aoun. In fact, a recent study of public opinion from Northeastern and the research company Gallup showed exactly that. It found that 73 percent of Americans expect the increased use of A.I. will remove more jobs that it creates. And 63 percent believe the development of new technologies and smart machines will widen the gap between the wealthy and the poor. Aoun acknowledges those concerns. To face them, he recommends being prepared and keeping an open mind. Pete Musto reported this story for Learning English. Kelly Jean Kelly was the editor. We want to hear from you. How do you think A.I. will affect education in the future? What concerns do you think are worth considering? Write to us in the Comments Section or on our Facebook page.